As one of the frigates from the Anzac-class, the HMAS Ballarat (FFH 155) was laid down in 2000 and commissioned into the RAN in mid-2004. Among the operational missions, the Ballarat has been involved in border protection as part of Operation Relex II, was deployed to the Gulf for Operation Catalyst, and was one of the two ships involved in the Operation Northern Trident 2009 round-the-world voyage. She was appointed to receive several upgrades such as the Anti-Ship Missile Defence (ASMD) upgrade, completing in 2015. At the start of 2005, Ballarat was involved in Operation Relex II, a border protection operation in Australia’s northern waters. 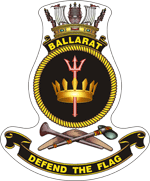 In March 2006, Ballarat was deployed to the Persian Gulf in as part of Operation Catalyst. On the morning of 13 March 2009, Ballarat was one of seventeen warships involved in a ceremonial fleet entry and fleet review in Sydney Harbour. On 20 April 2009, Ballarat and the Adelaide-class frigate HMAS Sydney departed from Sydney as part of Operation Northern Trident, a six-month round-the-world voyage by the two vessels. 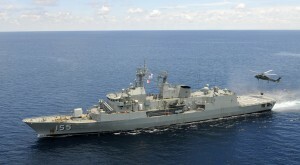 Ballarat has sufferd several upgrades and completed the Anti-Ship Missile Defence (ASMD) upgrade in September 2015.The upgrade included the fitting of CEA Technologies’ CEAFAR and CEAMOUNTphased array radars on new masts, a Vampir NG Infrared Search and Track system, and Sharpeye Navigational Radar Systems, along with improvements to the operations roomequipment and layout.